The Universal Store at Chadstone brings you the best selection of classic and modern denims plus street fashion from around the world. Located at the ground level of the Chadstone Fashion Capital, the Universal Store is where top picks from leading Australian and world brands are found, under one roof. The go-to location for fashionable youth of Melbourne, Universal Store is a popular stop for fashion conscious men and women, girls and boys, providing end-to-end products that meet all fashion needs. The store sells products from more than 160 Australian brands and international labels. It's popularity with Melbourne shoppers lies in quality and convenience. Because the store covers just about everything from shoes and apparels to accessories and more, you do not need to hunt for different products at different stores. You can create complete looks from your favourite look book without having to leave the Universal Store. 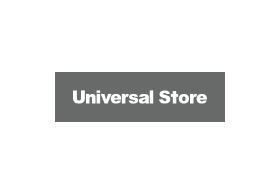 At the Universal Store in Chadstone, you will find season's hottest items from Lee, Wrangler, Mink Pink, Zanerobe, Nobody, Assembly, All About Eve, Neuw, One Teaspoon, Paint It Red, The Academy Brand, Herschel Supply Co., Vans, Happy Socks, Ladakh, Jelly beans, Rolla's, Thrills, Stussy, Deus Ex Machina, Uppercut Deluxe, Converse, Adidas, Autonomy, Bellroy, Clae, Edwin, Flux, Footsteps of Dawn, Flexfit, G-Star Raw, Icon Brand, Komono, Libertine, Le Specs, Lacoste, Mavi, Nixon, Pare Basic, Publish, Rains, Super, RVCA, Goliath, Sunny Life, Sushi Radio, The Fifth, The Horse, Token, Therapy, Timberland, Urban Originals, Urge, Wear Normal, Ziggy Eyewear, and Ziggy Denim to name a few. Quality and comfort are the hallmarks of the Universal Store, and have contributed to the rise in recognition of the company. At Universal, you will find the latest cuts, prints, colours, fabrics, and designs as well as the classic, style staples that have retained much of their traditional look, feel and design for years.